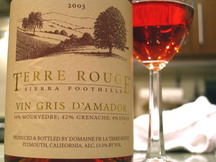 "It is the perfect wine for a hot summer afternoon on the patio or at your favorite bistro. In France it is practically a sacrilege to not be drinking a glass of rosé with your lunch at the cafe..."
Hmm. Well, it's the middle of the winter, drizzling outside like a scene out of Blade Runner. Not to mention the fact that I have no patio, it's after lunch and I'm certainly not in France (alas). Of course, suggestions, are just that - suggestions. I hereby ignore said suggestion and stick this bottle of lovely cherry-red, rosé wine into the fridge for a 12 minute cool-out. As the wine chills I proceed to construct a Dagwood steak sammy out of leftovers: prime rib in foil, a 1/2-eaten baguette and some spare cheese hiding out behind the margarine tub. Now, with the assistance of an old timey panini press, I simulataneously, warm, toast and melt. Voila. Cheesy-meaty-toasty goodness. I pop open the Vin Gris and discover that it hits the spot as a sidekick to my simple sandwich. However, this wine really starts to shine once it's warmed up a bit and I've finished (read: scarfed) the sandwich. bill easton is a dude and one of my favorite cali winemakers...I will have to try the rose. B - I always found it interesting that rose is relagated to warm, mediterranean-like scenes. Why? Do people only drink gnarly reds in winter. Pfft. Hardly - I drink white and bubbly during the winter months; so why not a little pink? Let me know if you come up with a nice rose for V-day.